New cumulative update build 14393.446 for Windows 10 1607 under testing. Microsoft is working on a new cumulative update for Windows 10 1607 Anniversary Update users. The upcoming update will push Windows 10 build to 14393.446. 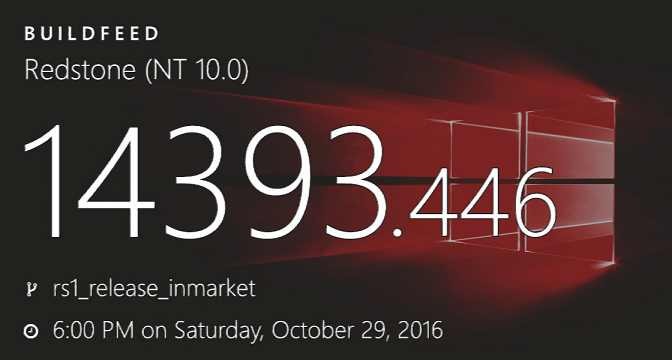 The new cumulative update build 14393.446 and mobile build 10.0.14393.446 was compiled on October 29, 2016. Windows 10 1607 build 14393.351 is now available for everyone. If you are facing a problem with kb3197954 (build-14393.351), try these fixes. Previously, the company released cumulative update KB3194798 (Build 14393.321), KB3192441 (build 10586.633) and KB3192440 (Build 10240.17146) for Windows 10 users.